Japan, recently received an order from Sonat Offshore Drilling Inc. of the U.S. to build a semisub- mersible offshore oil drilling rig deliverable in July 1985. Richardson, Texas, was organized recently to provide mobile satel- lite data communications systems and consulting services to the pe- troleum, marine, and defense in- dustries. Lynn B. Heitman is president of the new company, whose corporate headquarters are at 1819 Firman Drive, Suite 137 in Richardson. Mr. Heitman formerly was manager of marine engineering for Geophysical Service Inc., pe- troleum exploration subsidiary of Texas Instruments Incorpo- rated, of Dallas. Other principals of the com- pany are Bruce C. Toal and Rob- ert E. Bredehoft, vice presidents, and Terry McDonald, chief engi- neer. All formerly served on the marine engineering staff of Geo- physical Service Inc. and are highly experienced in various as- pects of satellite data communi- cations. Mr. Heitman said the company will offer communications sys- tems that will allow data to be transmitted at speeds up to 1.5 megabits per second via domestic or maritime satellites. The sys- tems are designed for rough mo- bile environments such as are encountered in land and marine seismic and drilling operations. Teco Transport & Trade Corpo- ration, of Tampa, Fla., a water transportation holding company. He will be based in Teco's corpo- rate headquarters in Tampa. Americas, as well as the U.S. The rig will be a semisubmers- ible unit newly designed to be able to endure severe sea condi- tions. It will have a fully water- tight superstructure, and will be capable of accommodating 150 persons and bearing a load of about 5,000 metric tons. John Shaw, to the same owner. This new order covers not only construction by MES bbt also the joint development of the rig with its owner. Marine Finishes help you fight corrosion...worldwide. Finishes are backed by more than 40 years of experience on our own fleet of blue-water ships, barges and river craft. And no matter where in the world you do marine painting, you'll find a nearby source of Du Pont high- performance Marine Finishes. Wilmington, Delaware, another 30 countries have DuPont subsidiaries and affiliates. One- and two-component primers for sand-blasted steel. Topcoats for corrosive and severe environments. Enamels Two-component epoxy resin finishes. Coatings High solids, low cost/sq. ft.
Primers and topcoats for long-term metal protection. 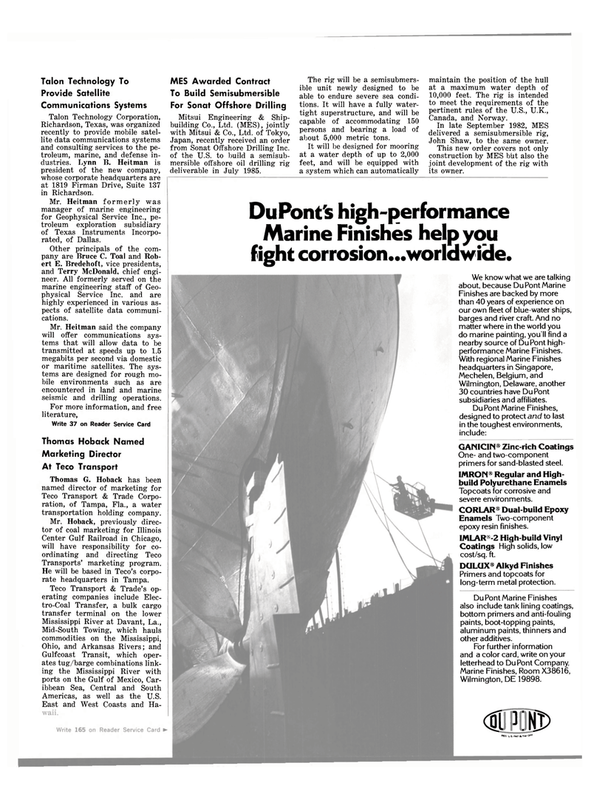 DuPont Marine Finishes also include tank lining coatings, bottom primers and anti-fouling paints, boot-topping paints, aluminum paints, thinners and other additives.